Have you ever wanted to know how much the meeting you were in was costing? Back when I was working at a huge company, I felt like I often had to go to big and boring meetings. More than once I figured out an approximate cost of the meeting, and more than once I was a little flabbergasted by how easy it is to rack up a $3,000 meeting. Back when I started at PayScale, my coworkers were listing off all of the projects that I would be working on in the next couple of months... and this was one of them. This project made sense to me, and I knew exactly who was going to be using it. me. That thing is scary sweet! Figured I better get caught up on my doing boing over the last 6 months. 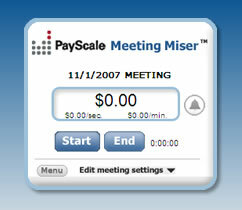 I have been using your meeting miser tool to see how much money I waste in some meetings. I don't need to tell you how high the costs go in some of them. You know whats up... awesome tool man.